This graph is one of several included in the report I am presenting to Bertrand's Keto Team at his one month check-up tomorrow. I think it pretty much says it all! The diet is working slowly but surely for Bertrand. :) On a daily basis it is so hard to see the forest for the trees, but a graph like this sure does help! 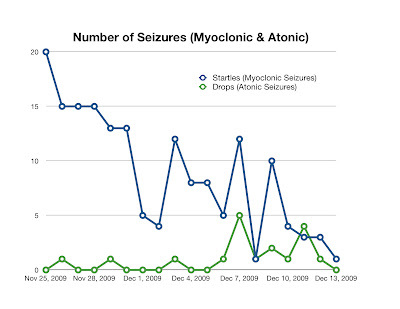 NOTE: These numbers start from a week into the diet when these seizure types became infrequent enough to count! Before starting the diet, both kinds of seizures were in the 100s. We are still not counting Bertrand's absence type seizures. Wooo, fancy graph! :D Cristina, this is so, so awesome!! Have you gone back to re-read your earlier posts, pre-diet to see how you didn't dare hope that the diet would help? I am doing a happy dance for you!! Hurray! Agree that a picture is better than a thousand words! Great for my beautiful, little champion and his great TEAM: MOM and DAD!